After spending a few months in 2006 working as volunteers at Reserva Ecologica de Guapi Assu (REGUA) in the Brazilian Atlantic Forest, we decided to return there this year on a birding trip, but this time at the beginning of the austral summer. This enabled us to compare the birding here in October with the winter birding we experienced last year. On this trip we spent most of our time birding the trails at REGUA, but we also made of couple of excursions to nearby Vale das Taquaras at Rio Bonito de Cima, and Pico da Caledonia in search of high altitude species. Most nights we stayed at the excellent Guapi Assu Bird Lodge at REGUA. We flew from London Heathrow to Rio de Janeiro Galejo - Antonio Carlos Jobim via Madrid with Iberia Airlines. On the whole we found Iberia sufficient and punctual, although the planes had little leg room and the food was poor even by airline standards. The return fair cost us £527 each including taxes. We booked online at ebookers and the route is one of the most direct, taking 14 hours including the stop-over. Note that British Airways fly direct from London to Rio but the fare is significantly more expensive. We arranged in advance for the transfer service offered by the lodge at REGUA. This costs US$75 each way and is quick and efficient with a very friendly driver. If you plan to hire a car then see the Guapi Assu Bird Lodge website for detailed directions to REGUA from Rio. We decided to base ourselves at Guapi Assu Bird Lodge and use a combination of lodge-run excursions and public buses to visit other birding sites nearby. This worked well for what we wanted to do and saved us the cost and hassle of hiring a car. However, if we had wanted to travel further a field, or stay at several places, then we probably would have hired a car. At the time of this visit the exchange rate was about 3.6 Brazilian reais (R$) to the UK pound. Public buses, food and drink are all very cheap compared to the UK. In addition to the poor All the Birds of Brazil: An Identification Guide, D Souza, 2006 (ISBN-10: 1905268017), I also took the excellent new Collins Field Guide to the Birds of South America: Non-Passerines, JRR Mata, F Erize & M Rumboll, 2006 (ISBN-10: 0007150849). Although only covering non-passerines, this guide was very useful for wetland birds, raptors, nightjars, hummingbirds, trogons, woodpeckers etc and the plates are very good. For the more difficult passerines such as furnariids, woodcreepers, antbirds and tyrant-flycatchers, I decided to produce by own plates by scanning plates from Handbook of the Birds of the World. These worked a treat, although I long for the day that a decent field guide for this region of Brazil is finally published. Unlike on our visit last year, this time I was able to bring sound recordings with me. Many of these I obtained from www.xeno-canto.org. I used an Apple iPod Nano (4GB) with a set of Philips speakers (model SBA290), both of which worked well, although these speakers eat batteries very quickly and so I turned them off after each use. I advise using rechargeable batteries and taking a few spare sets. I also took a scope with me which was useful for the wetlands and the trip to Pico da Caledonia, but not taken into the forest. The Guapi Assu Bird Lodge website has useful information on entry requirements to Brazil, inoculations etc. REGUA is a private nature reserve situated in the Serra dos Orgaos mountains, about 80 km north-east of Rio de Janeiro. The reserve is large (almost 7000 ha) and contains wetlands and Atlantic Forest ranging in altitude from 35 m to about 2000 m above sea level. REGUA is also a highly active conservation project and their work includes employing local rangers to patrol the reserve, reforestation, education programs for local school children, reintroduction programs and research. For further details see the REGUA website. Over 450 species of birds have now been recorded at REGUA and this is one of the best sites to try for the difficult Shrike-like Cotinga (Elegant Mourner) and Giant Snipe. 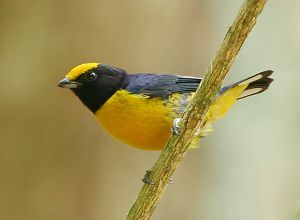 Other key birds present on the reserve include Brown-backed Parrotlet (rare), Golden-tailed Parrotlet, Blue-bellied Parrot, White-bearded Antshrike (rare), Salvadori's Antwren, Black-cheeked Gnateater, Spotted Bamboowren, Pin-tailed Manakin, Eastern Striped Manakin, Eye-ringed Tody-Tyrant and Russet-winged Spadebill. A few years ago REGUA renovated an old farm house into a lodge with the aim of attracting visitors to help fund their conservation work. The lodge - Guapi Assu Bird Lodge - is beautifully situated overlooking the reserve, very comfortable and well equipped. The quality (and quantity) of the food is excellent with breakfast (which was prepared for us by the staff at whatever time we requested), lunch (or a packed lunch if spending the whole day in the field) and dinner included. The reserve is run by Nicholas and Raquel Locke who are extremely enthusiastic about the Atlantic Forest and it's wildlife. There are two excellent local bird guides (Adilei and Leonardo) available on request, both of which I can highly recommend. We spent most of our time with Adilei, a local ex-hunter who although speaks virtually no english (he is learning fast and knows most of the bird names), is one of best guides I have been guided by. Instead of using recordings, Adilei imitates the birds by whistling and could call in a vast number of species. He also knew exactly where the birds were and I would certainly have seen far less on my own, even armed with my recordings. 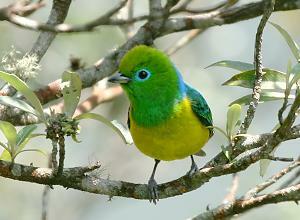 For further information on the lodge and a reserve bird list, see www.guapiassubirdlodge.com. Listed below are the main birding areas we visited at REGUA. For each I have listed the main target birds followed by our key sightings. REGUA can provide complete lists for each trail on request. The 4x4 Track is a good trail for low elevation species and is the only known site where Eastern Striped Manakin is regular at REGUA. Other target species here include White-necked and Mantled Hawks, Black-and-white and Black Hawk-Eagles, Maroon-bellied and Plain Parakeets, Frilled Coquette, Buff-bellied and Crescent-chested Puffbirds, Channel-billed Toucan, Bare-throated Bellbird, Black-tailed Tityra, Long-billed Wren, Brazilian and Brassy-breasted Tanagers and Yellow-green Grosbeak. Rarities here include Saffron Toucanet, Red-ruffed Fruitcrow, Hangnest Tody-Tyrant and Black-legged Dacnis. Black-capped Donacobius occurs at the Small Wetland, located at the start of this track. On this trip we only birded this track once and bird activity was very quiet. Black-and-white Hawk-Eagle, Scaly-headed Parrot, Ferruginous Pygmy-Owl, Rufous-capped Motmot and Long-billed Wren. A very steep but beautiful trail leading through primary and bamboo forest up to 950 m, and good for mid to high elevation species. Allow a full day for this trail. Target birds here include Solitary Tinamou (difficult), Dusky-legged Guan, Golden-tailed Parrotlet, Blue-bellied Parrot, Least Pigmy-Owl (recently found here), White-throated Hummingbird, Brazilian Ruby, Saffron and Spot-billed Toucanets, Yellow-browed Woodpecker, Pallid Spinetail, Giant Antshrike, White-bearded Antshrike (rare in the bamboo at the top of the trail), Rufous-backed Antvireo, Salvadori's Antwren (scarce), Ferruginous and Ochre-rumped Antbirds, Rufous and Black-cheeked Gnateaters, Spotted Bamboowren, Shrike-like Cotinga (on territory during the summer), Greenish Schiffornis, Oustalet's Tyrannulet (around the 1200 m post), Russet-winged Spadebill (rare), Brown Tanager, Green-chinned Euphonia, Temminck's Seedeater and Half-collared Sparrow. Mammals on this trail include Brown Howler, Brown Capuchin and Woolly Spider Monkeys (rare). Mantled Hawk, Biscutate Swift, Yellow-fronted, Yellow-eared and Yellow-browed Woodpeckers, Pale-browed Treehunter, Black-capped Foliage-gleaner, White-eyed Foliage-gleaner, White-throated Woodcreeper, Giant Antshrike, Ferruginous Antbird, Scaled Antbird, Streak-capped Antwren, Spotted bamboowren, Shrike-like Cotinga, Greenish Schiffornis, Black-tailed Tityra, Brown, Rufous-headed, Olive-green and Azure-shouldered Tanagers, Blue-naped Chlorophonia, Half-collared Sparrow (H) and Green-winged Saltator. Since the wetland was restored in 2005 an amazing 180 species have been recorded here. The star bird here is Giant Snipe which are best looked for at dawn or dusk. Other target birds include Whistling and Capped Herons, Rufescent Tiger-Heron, Pinnated and Stripe-backed Bitterns, Masked Duck, Grey-headed Kite, Crane Hawk, Laughing and Aplomado Falcons, Rufous-sided Crake, Slaty-breasted Wood-Rail, Ash-throated Crake, Blackish Rail, White Woodpecker, Tail-banded Hornero, Sooty Tyrannulet, Yellow-browed Tyrant and Long-billed Wren. At night Pauraque, Rufous Nightjar (occasional) and Scissor-tailed Nightjar can be found found, along with Tropical Screech-Owl and Tawny-browed Owl near the lodge. Rarities recorded include Osprey, Snail Kite and Sungrebe. Least and Pied-billed Grebes, Whistling, Capped and Striated Herons, Rufescent Tiger-Heron, Stripe-backed Bittern, Masked Duck, Plumbeous Kite, Black-and-white Hawk-Eagle, Limpkin, Rufous-sided Crake, Ash-throated Crake (H), Blackish Rail, Sungrebe, South American Snipe, Giant Snipe, Striped cuckoo, Pauraque, Scissor-tailed Nightjar, Ringed, Amazon and Green Kingfishers, Tail-banded Hornero, Yellow-chinned Spinetail, Yellow Tyrannulet, Common Tody-Flycatcher, Yellow-lored Tody-Flycatcher, Yellow-browed Tyrant, Cattle Tyrant, Brown-chested Martin, White-rumped Swallow, Yellowish Pipit, Lemon-chested Greenlet, Masked Yellowthroat, Brazilian Tanager, Pileated Finch, White-bellied Seedeater, Chestnut-capped and Chopi Blackbirds. There are a number of short trails near the lodge that pass through secondary forest, grassy meadows and along the edge of the wetland. Birding both the wetland and these trails can often produce over 100 species in a day. At the time of our visit some of these trails were marked and some not, but they are all very easy to follow. The target birds here are lowland species such as Orange-winged Parrot, Squirrel, Guira and Striped Cuckoos, Ferruginous Pygmy-Owl, Rufous-breasted and Reddish Hermits, White-chinned Sapphire, Rufous-tailed Jacamar, Crescent-chested Puffbird, Channel-billed Toucan, Blond-crested Woodpecker, Chicli Spinetail, Tufted and Chestnut-backed Antshrikes, Sooretama Slaty-Antshrike, White-flanked Antwren, White-bearded Manakin (there is a lek on the Nursery Trail), Yellow-lored Tody-Flycatcher, Bran-coloured Flycatcher, White-winged Becard, Moustached and Long-billed Wrens. Grey-headed Kite, Bicoloured Hawk, Crane Hawk, Savanna Hawk, Squirrel Cuckoo, Ferruginous Pygmy-Owl, White-chinned Sapphire, Rufous-tailed Jacamar, Channel-billed Toucan, Thrush-like Woodcreeper, Tufted Antshrike, Chestnut-backed Antshrike, Sooretama Slaty-Antshrike, White-flanked Antwren, White-bearded Manakin, Southern Beardless-Tyrannulet, Yellow-breasted Flycatcher, Bran-coloured Flycatcher, White-winged Becard, Moustached and Long-billed Wrens, Yellow-backed, Hooded and Brazilian Tanagers and Orange-bellied Euphonia. To see which trail(s) we saw a particular bird on, see the bird list at the end of this report. This trail lies in an area of land just outside of, but bordering, REGUA. I have included it as part of the reserve in this report because the area is currently in the process of being bought by REGUA with funds from the World Land Trust. The trail is reached by driving along the dirt road from the reserve entrance to Matumbo, where you turn right at the shop and continue through the village. When you reach an obvious fork, turn left heading upwards and the road slowly climbs through open grassy farmland into a large valley containing excellent forest. Park at the end of the road and take the rough track to the left of the house. The entrance to the Matumbo Trail itself is on the right at the bend in the track by the small house on the left. The dirt road also passes through farmland and some interesting forest and it is worth stopping occasionally to scan. The REGUA bird guides had recently recorded three species in this area that we wanted to see - Frilled Coquette, Saffron Toucanet and Swallow-tailed Cotinga. We really liked this whole area, not only because it was good for birds, but the birding was also very varied, and some of it could be done from a car which was useful when it was raining. This is can be done in a half or full day. Mantled Hawk, Maroon-bellied Parakeet, Plain Parakeet, Burrowing Owl, Grey-rumped Swift, Saw-billed Hermit, Frilled Coquette, Crescent-chested Puffbird, Buff-bellied Puffbird, White-eared Puffbird, Channel-billed Toucan, White Woodpecker, Yellow-eared Woodpecker, White-eyed Foliage-gleaner, Rufous-breasted Leaftosser, White-throated Woodcreeper, Scaled Woodcreeper, Spot-backed Antshrike, Spot-breasted Antvireo, Cliff Flycatcher, Olive-green and Red-necked Tanagers and Pileated Finch. A low to mid elevation forest trail starting from Casa Pequisa (where there are some excellent hummingbird feeders). This is an easy trail to walk and it passes through some superb scenery. It can be done as a half or full day walk. This trail is good for Shrike-like Cotinga in the austral winter, but these birds move slightly higher up in the summer months and we had to hike for 30 minutes up the Elfin Forest Trail to find one. Other species regular on the Waterfall Trail include White-necked Hawk, Saw-billed Hermit (usually coming to the feeders at Casa Pesquisa), Reddish Hermit, Rufous-capped Motmot, Crescent-chested Puffbird, Spot-billed Toucanet, Yellow-eared Woodpecker, Unicoloured Antwren, White-bibbed Antbird, Rufous-capped Antthrush, Variegated Antpitta, Black-cheeked Gnateater, Slaty Bristlefront (around the 900 m post), Sharpbill, Bare-throated Bellbird, Pin-tailed Manakin (especially between the 1400 m and 1850 m posts), Eye-ringed Tody-Tyrant, Southern Antpipit, Grey-hooded Attila, Rufous-headed, Olive-green, Azure-shouldered, Golden-chevroned and Turquoise Tanagers and Red-legged Honeycreeper. Rarities on this trail include Swallow-tailed Cotinga. Brown Capuchin Monkey is present along this trail and the rare Woolly Spider Monkey has also been seen recently. White-necked Hawk, Maroon-bellied Parakeet, Ashy-tailed Swift, Saw-billed Hermit, Reddish Hermit, Black-throated Trogon, Rufous-capped Motmot, Spot-billed Toucanet, Yellow-throated Woodpecker, Ochre-breasted Foliage-gleaner, Black-capped Foliage-gleaner, Rufous-breasted Leaftosser, Sharp-tailed Streamcreeper (H), Lesser Woodcreeper, Unicoloured Antwren, Scaled Antbird, Rufous-capped Antthrush, Black-cheeked Gnateater, Slaty Bristlefront, Pin-tailed Manakin, Eye-ringed Tody-Tyrant, White-throated Spadebill, Whiskered Flycatcher, Grey-hooded Attila, Greyish Mourner, Red-legged Honeycreeper and Yellow-green Grosbeak. Vale das Taquaras is a small birdwatching lodge that, at the time of our visit, was preparing to open to visitors for the first time. We were made aware of the place by Nicholas at REGUA and decided to spend two days there. Lila Ferrez, the owner, has long been interested in birds, and on a small scale also carries out some reforestation on her land. In the past Lila was has worked with well known ornithologist Helmut Sick, and he has visited here several times. The forest here is good for high altitude species, lying between about 900 m and 1200 m.
The accommodation is of a high standard, very comfortable and well equipped. The food is superb and the two trail heads are within easy walking distance. Getting here took a while although it is fairly easy to find. From REGUA it is about a two hour drive (from Rio about three and a half hours) and the last hour was on very bumpy roads which ideally require a 4x4. However, note that there is a slightly longer alternative route that is easily passable by standard cars year round. Vale das Taquaras has some excellent birds that can be quite difficult to catch up with. 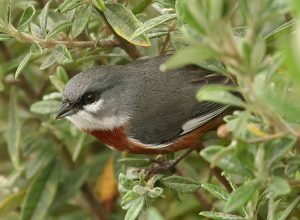 These include Blue-bellied Parrot (not seen by us but apparently occasionally seen in the garden), Long-trained Nightjar (there are two areas where this species is regularly seen although we had no luck on our only night, partly due to a barking dog chasing our car), Mottled Owl, Frilled Coquette and Amethyst Woodstar. Birds we saw in the lodge grounds include Rufous-thighed Hawk, Common Potoo, Green-barred Woodpecker, Pallid Spinetail, Crested Oropendula and Rufous-crowned Greenlet. The lodge also has lots of hummingbird feeders and these attracted good numbers of Scale-throated Hermit, White-throated Hummingbird, Violet-capped Woodnymph, Brazilian Ruby, Black Jacobin and Frilled Coquette. We spent most of our time here birding this newly cut trail, which passes through some excellent bamboo and montane forest. The trail was very well marked every 50 m by numbered posts and was fairly easy walking. Brown Tinamou (H), Black Hawk-Eagle, Spot-winged Wood-Quail (H), Mottled Owl, White-collared Foliage-gleaner, Black-billed Scythebill, Short-tailed Antthrush, Rufous Gnateater, Bare-throated Bellbird (this is probably the best place I have been for this species, especially for getting good views. They were everywhere! 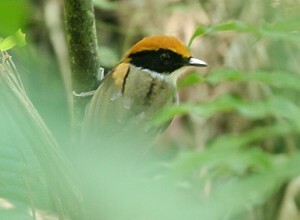 ), Greenish Schiffornis, Drab-breasted Bamboo-Tyrant, Temminck's Seedeater, Uniform Finch and Pectoral Sparrow. Pico da Caledonia is one of the highest peaks in the Serra dos Orgaos mountains, reaching 2219 m. This is one of only two known sites (and the one with by far the easiest access) for the extremely rare Grey-winged Cotinga, and there is also a population of Itatiaia Thistletail here. Other high altitude species found here include Plovercrest, Large-tailed Antshrike, Rufous-tailed Antbird, Mouse-coloured Tapaculo, Black-and-gold Cotinga, Highland Elania, Serra do Mar Tyrannulet, Blue-billed Black-Tyrant, Velvety Black-Tyrant, Shear-tailed Grey Tyrant, Rufous-crowned Greenlet, Diademed Tanager and Bay-chested Warbling-Finch. Swallow-tailed Cotinga, Dusky-tailed Antbird and Red-legged Seriema are also present lower down on the mountain. We decided to visit this site on an excursion organised by REGUA. Adilei and Nicholas knew exactly where to go for all the target birds and we had a very successful trip despite only hearing the cotinga and seeing a distant possible before the mist rolled in. Nicholas drove us most of the way to the top up a very steep cobbled road, stopping occasionally to check out birds. Most of the birding is done walking the top most section of road and the stairs to the summit. Mist is a common problem for birders here looking for Grey-winged Cotinga, because you look for them by scanning across the canopy of the elfin forest at the top of the mountain. From late morning onwards mist often rolls in, and so an early start is advisable to maximize the time available for scanning. 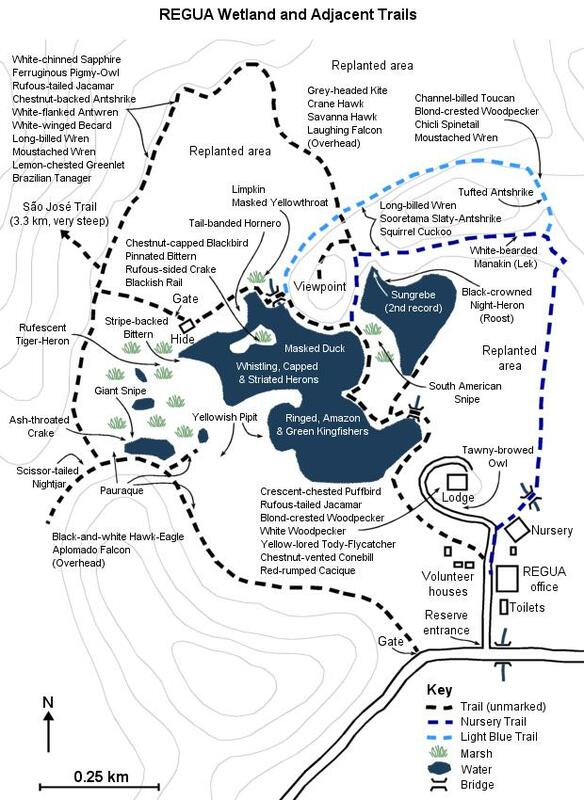 Also note that to access the summit (necessary for Itatiaia Thistletail) you will need your passport to give to the guards (who will keep it while you are on the summit) at the gate (owned by Petrobras). The summit is open from 07:00 to 17:00 (closed Mondays) and access is free. Plovercrest, Itatiaia Thistletail, Sharp-tailed Streamcreeper, Large-tailed Antshrike, Rufous-tailed Antbird, Mouse-coloured Tapaculo, Highland Elaenia, Blue-billed Black-Tyrant, Black-capped Becard, Rufous-crowned Greenlet, Rufous-browed Peppershrike, Diademed Tanager, Bay-chested Warbling-Finch and Green-winged Saltator. This list includes all the species that I recorded on this trip (all were seen unless indicated otherwise). All records are at REGUA unless indicated otherwise. The taxonomy and nomenclature follows Clements, James F, Birds of the World: A Checklist, 5th edition (updated 2005). Heard at Vale das Taquaras on 13th. Seen daily at the lodge wetland where the highest count was 8 on 15th. I found an adult at the lodge wetland on 11th which is the first record for REGUA. The bird was still present on 15th. 8 over the lodge wetland on 19th. Many seen near Rio de Janeiro on 21st. 3 at the lodge wetland on 11th. Seen most days at the lodge wetland with my highest count being 4 there on 18th. 1 on a river near Cachoeiras de Macacu on 18th, and 2 in roosting with Cattle Egrets at the lodge wetland on 19th and 1 there on 20th. 1+ seen at the lodge wetland most days. Abundant. The evening roost at the lodge wetland was a spectacular sight with most birds being in summer plumage. My highest count was about 400 there on 14th. 1-2 seen at the lodge wetland most days. Singles seen frequently at the lodge wetland and 1 ad. and 1 imm. there on 19. 1 adult at the lodge wetland on 18th. 1 seen and photographed from the hide at the lodge wetland on 15th. Seen most days at the lodge wetland with 10 there on 11th being my highest count. Common at the lodge wetland. Good numbers seen daily at the lodge wetland with most being females. 15 there on 19th was my highest count. 2 seen well and photographed over the forest behind the lodge wetland on 15th. 1+ adults seen around the lodge wetland on 15th. A pair seen and photographed nesting in the trees opposite the lodge at Vale das Taquaras on 13th. 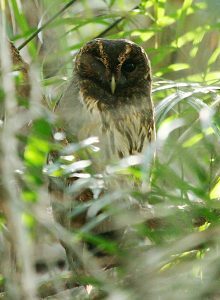 1 seen very well at REGUA perched in the forest behind the lodge wetland (at the start of the Sao Josa Trail) on 15th. 1 seen flying and perched in trees behind the lodge wetland on 15th. Amazing views at REGUA this year. 3, including a pair seen displaying over the meadow (by post 1150) along the Waterfall Trail on 12th, 1 there on 16th and 1 in the forest by post 1100 of the Waterfall Trail on 19th. 1 seen over the forest from the very top of the Elfin Forest Trail on 16th, and 1+ seen at the open area along the Matumbo Trail on 21st. 2 at the lodge wetland on 11th, 1 seen from the Light Blue Trail on 19th, and 1 along the dirt road between the reserve entrance and Matumbo on 21st. 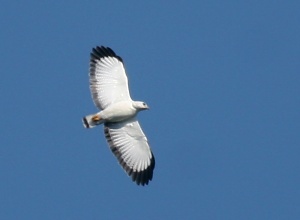 1 seen and photographed over the lodge wetland and another over the 4x4 Track to Casa Anibal on 11th. 1 over the Long Trail at Vale das Taquaras on 14th. 1 heard from the new trail through the newly replanted area near the lodge wetland on 15th. 1 along the dirt road to Casa Pesquisa on 19th. Heard frustratingly close at Vale das Taquaras on 13th. 1 at the lodge wetland on 17th. Heard frequently at the lodge wetland. 2 seen very well in response to playback at the lodge wetland (just before the small bridge across to the hide) on 15th. Heard at the lodge wetland. Heard regularly at the lodge wetland and 3 seen there - 1 seen from the hide on 15th, and two seen feeding in the open (by the wooden bridge to the hide) on 19th. Abundant at the lodge wetland. 1 seen at the lodge wetland (in the creek in the north-west corner of the new pool) on 15th and 17th is the second record for REGUA. 1 at the lodge wetland on 11th. 1 seen in flight at the lodge wetland late evening on 11th. Seen around Rio de Janeiro on the way to the airport. 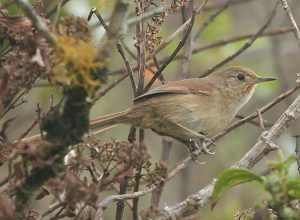 1 heard at Vale das Taquaras on 14th, 1 heard on the Elfin Forest Trail on 16th, 1 heard on the Matumbo Trail on 17th, and 1 heard at Pico da Caledonia on 18th. 1 seen the road to the Matumbo Trail on 15th. 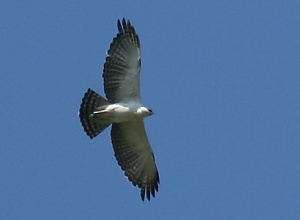 Heard frequently at REGUA and 1 seen poorly in flight along the road to the Matumbo Trail on 21st. Also heard Vale das Taquaras. Heard on the Waterfall Trail 12th, seen and heard on the Waterfall Trail on 16th and 2 on the Matumbo Trail on 17th. Seen frequently at REGUA. The largest flock was 14 over the road to the Matumbo Trail on 17th. Also 1 at Vale das Taquaras on 14th. 3 seen on the 4x4 Track to Casa Anibal on 11th, heard on the Matumbo Trail on 15th and heard on the road to Casa Pesquisa on 16th. 1 seen on the Light Blue Trail near the lodge on 19th. Seen frequently around farmland and the lodge wetland. 1 seen at the lodge wetland on 11th and 15th. 2 found roosting on the Long Trail (on the left just before post 1400) at Vale das Taquaras on 14th. 2 seen extremely well in the lodge garden on 20th. 1 seen at the open area at the top of the 4x4 Track to Casa Anibal on 11th, 1 seen on the new trail behind the lodge wetland and another seen and photographed in the lodge garden on 15th and 1 heard on the Waterfall Trail on 19th. 2 pairs seen frequently along the dirt road to Casa Pesquisa and up to 2 seen regularly on farmland between the reserve entrance and the Matumbo Trail. 1 seen very well in the garden at Vale das Taquaras on 13th. 1 seen in the garden at Vale das Taquaras on 13th. At REGUA heard most nights at the lodge wetland (from the lodge garden). Also 3 adult males at the lodge wetland seen very well on the ground and in flight by torch light just after dusk on 20th. The best place to try is the track following the lodge wetland at the base of the grassy hill opposite the lodge (see Scissor-tailed Nightjar for directions). 1 male seen very well in flight by torch light at the lodge wetland on the evening of the 20th. From the hide walk away from the wetland and through the gate, follow the track towards the forest edge (the wetland will be behind you), turn left at the forest edge and continue (keeping the wetland on your left) until you reach the corner of the wetland. Here the track meets another (4x4) track at the base of the grassy hill opposite the lodge. Turn right along this track (away from the wetland) and walk slowly along for about 10 metres or so. The bird was flying right above the track at the edge of the trees. 2+ with Biscutate Swifts at the top of the Elfin Forest Trail on 16th. Several seen well at the top of the Elfin Forest Trail on 16th. 2 near the start of the Matumbo Trail on 15th and several over the open area on the Matumbo Trail on 17th. 2 over the lodge on 11th and several near the start of the Waterfall Trail on 19th. 1 just before the waterfall on the Waterfall Trail on 12th, and up to 3 beside the track near the start of the Matumbo Trail on 15th. Common at Vale das Taquaras, where I even had to trap and release one that got stuck in the lodge. 1 seen well on the Waterfall Trail on 19th. Seen frequently in the lodge garden and 1 at the lodge wetland on 11th. Pretty common compared to our visit last year. 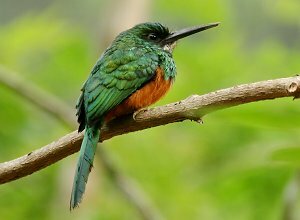 Seen frequently in the lodge garden, 1 on the 4x4 Track to Casa Anibal on 11th, 1 on the track to the Matumbo Trail on 15th, and many at the feeders at Vale das Taquaras on 13th and 14th. 1 male of the race lalandi seen well at Pico da Caledonia on 18th. 1+ coming to feeders at Vale das Taquaras on 13th. At REGUA there was 2 along the track by the entrance to the Matumbo Trail on 17th and 1 there on 21st. 1 female at Pico da Caledonia on 18th. Several seen at Vale das Taquaras on 13th and 14th. At REGUA, 1 male at the lodge wetland on 15th and 1 female on the Matumbo trail on 17th. 1 near post 1100 of the Nursery Trail and another on the new trail that follows the forest edge behind the lodge wetland on 15th. Seen coming to feeders at Vale das Taquaras on 13th and 14th, 1 at feeders at a resort near Vale das Taquaras on 13th, and 1 at Pico da Caledonia on 18th. 1 female at Vale das Taquaras and another female at feeders at a resort near Vale das Taquaras on 13th. 1 male on the Waterfall Trail on 12th. A pair on the Waterfall Trail on 12th, 2 on the Elfin Forest Trail on 16th, and 2-3 on the Matumbo Trail on 17th. 1 over the lodge on 15th and 1 at the lodge wetland on 17th and 19th. 1 at the lodge wetland on 11th and 1 there on 15th. 1 at the lodge wetland on 18th. Heard often around REGUA. Also 1 seen on the 4x4 Track to Casa Anibal on 11th, 1 seen on the Waterfall Trail on 12th and 1-2 seen near a nest on the Waterfall Trail on 19th. 1+ males on the new trail along the forest edge at the back of the lodge wetland, and a pair near the end of the road to the Matumbo Trail on 15th, 3 along the road to the Matumbo Trail on 17th, 1 by a nest near post 1100 of the Nursery Trail on 19th and a pair there on 20th, and a pair near the end of the road near the start of the Matumbo Trail on 21st. 1 along the dirt road leading to the Matumbo Trail on 15th, 3 there and on 17th, 1 there on 21st, and 1 on the Matumbo Trail itself on 21st. 1 seen very well along the dirt road leading to the Matumbo Trail on 15th. 1 along the dirt road leading to the Matumbo Trail on 17th and 2 there on 21st. 1 female on the Waterfall Trail on 12th, 2 on the Elfin Forest Trail on 16th, and 1 male on the Waterfall Trail on 19th. 1 seen on along the track at the entrance to the Matumbo Trail on 15th, and 1 seen around the REGUA office and lodge garden on 19th. Also heard frequently at REGUA and heard at Vale das Taquaras on 14th. 4 seen along the dirt road to the Matumbo Trail on 21st. 2 on the Elfin Forest Trail on 16th. 1 on the Elfin Forest Trail on 16th, and 2 on the Matumbo Trail on 21st. 1 seen on the Waterfall Trail on 12th. 1 on the Elfin Forest Trail on 16th. 1 at Vale das Taquaras on 14th. Seen regularly at REGUA in open areas. 3 in the lodge garden on 21st. Seen at the lodge wetland. 1 heard at Vale das Taquaras on 14th. 2-3 seen well at Pico da Caledonia (from the stairs to the summit) on 18th. Seen frequently at REGUA and 1 at Vale das Taquaras on 14th. 1 seen and photographed on the Elfin Forest Trail (by post 1400) on 16th. 1 on the Matumbo Trail on 17th. 1 on the Waterfall Trail and 1 on the Elfin Forest Trail on 12th. 1 on the Waterfall Trail on 12th, and 1 on the Elfin Forest Trail on 16th. 1 at Vale das Taquaras on 13th. 1 heard on the Matumbo Trail on 15th, 1 on the Elfin Forest Trail on 16th, 1 on the Matumbo Trail on 17th, and 1+ on the Matumbo Trail on 21st. 1 showed well on the Waterfall Trail on 12th, 1 heard at Vale das Taquaras on 13th, 1 seen on the Waterfall Trail on 19th, and 1 seen and photographed on the Matumbo Trail on 21st. 1+ heard (and a probable seen in flight) at the waterfall on the Waterfall Trail on 12th, and 1 seen well and photographed at Pico da Caledonia on 18th. Frequently heard at REGUA. 1 seen by post 1100 of the Nursery Trail on 15th. Seen and heard often at REGUA and Vale das Taquaras. 1 on the Elfin Forest Trail on 16th and 1 on the Matumbo Trail on 17th. 1 on the Lost Trail on 16th. 1 on the Waterfall Trail on 19th. 1 seen on the Long Trail at Vale das Taquaras on 14th. 1 heard on the Elfin Forest Trail on 12th, 1 heard on the Elfin Forest Trail on 16th, and 1 seen on the Matumbo Trail on 17th. 1 female seen after a lot of hard work on the Elfin Forest Trail on 16th. 1 male seen well on the Light Blue Trail (on the right of the trail between posts 1200 and 1250) on 20th. 1 male seen very well and photographed at Pico da Caledonia on 18th. Seen frequently around the lodge garden, lodge wetland and adjacent trails. A pair on the Nursery Trail and another pair on the Light Blue Trail on 20th. Heard frequently at REGUA and Vale das Taquaras. 1 seen on the Matumbo Trail on 21st. 1 at Vale das Taquaras on 14th, 1 on the Matumbo Trail on 17th and 1-2 there on 21st. 1+ males on the Waterfall Trail on 12th, 1 male on the Nursery Trail on 15th, 1 male on the Waterfall Trail on 19th, and 2 males and 2 females on the Nursery Trail on 20th. 1 heard at Vale das Taquaras on 13th, 2 seen there on 14th, and 1 on the Elfin Forest Trail on 16th. 2 at Pico da Caledonia on 18th. 2 males seen and another heard on the Waterfall Trail on 12th, 1 on the Elfin Forest Trail on 16th, and 1 male on the Waterfall Trail on 19th. 1+ seen on the Elfin Forest Trail on 16th, others heard at REGUA. Heard often at REGUA. 1 male seen on the Long Trail at Vale das Taquaras on 14th. 2+ on the Long Trail at Vale das Taquaras on 13th and 1 there on 14th. Heard at REGUA. 1 seen extremely well on the Waterfall Trail on 19th. 1 on the Long Trail at Vale das Taquaras on 14th. Frequently heard at REGUA and Vale das Taquaras. 1 came in very close on the Waterfall Trail on 12th but didn't show. Seen well on the Long Trail at Vale das Taquaras where our highest count was 4 on 14th. 1 male seen on the Waterfall Trail on 12th, others heard at REGUA. 1 seen well on the Elfin Forest Trail (by post 1400) on 16th. 1 heard on the Waterfall Trail on 19th. 1 male seen very well and photographed in the open at Pico da Caledonia on 18th. Many others also heard there. 1 seen very well and photographed singing on the Elfin Forest Trail on 12th and again on 16th. Heard at Pico da Caledonia on 18th. Heard at Pico da Caledonia on 18th. A distant bird, either this species or a female Black-and-gold Cotinga, was seen distantly but flew before I could get the scope on it. Several males seen well at Vale das Taquaras on 13th where they are very common. Heard regularly at REGUA but not seen (although we saw them so well at Vale das Taquaras that we didn't bother trying to see them at REGUA). Seen regularly at REGUA. The Nursery Trail and trails around the lodge wetland were the best spots. 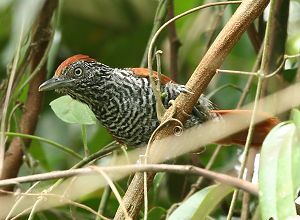 Seen frequently at REGUA (usually males). 1 male also seen at Vale das Taquaras on 13th. Heard on every visit to the Waterfall Trail 1+ male seen there on 12th. Also heard at Vale das Taquaras on 13th and 14th, and a male was also seen in forest near Vale das Taquaras on 13th. 1 on the Long Trail at Vale das Taquaras on 14th, and 1 on the Elfin Forest Trail on 16th. 1 at the forest on the edge of the lodge wetland on 15th. Seen at the lodge wetland, in the adjacent forest and on the road to the Matumbo Trail. 1 at Pico da Caledonia on 18th. 1 seen and another heard on the Waterfall Trail on 12th, and 1 seen on the Waterfall Trail on 16th. 1 on the Waterfall Trail on 19th and 1 on the Matumbo Trail on 21st. 1 on the Waterfall Trail on 12th, 1 on the Long Trail at Vale das Taquaras on 14th, 1 on the Matumbo Trail on 17th, 1 on the Waterfall Trail on 19th, and 1 on the Matumbo Trail on 21st. 1 seen on the Long Trail at Vale das Taquaras and another heard in forest near Vale das Taquaras on 13th. 1 seen on the Waterfall Trail on 12th and 1 seen at close range on there on 19th. Others heard at REGUA. Seen and heard frequently around the lodge garden and the lodge wetland. 1 seen on the Waterfall Trail on 12th, 1 seen at Vale das Taquaras on 14th, 1 heard and another seen on the Elfin Forest Trail on 16th, and 1 heard on the Waterfall Trail on 19th. 1 heard at the lodge wetland on 15th, and 1 seen on the Nursery Trail on 20th. 1 seen on the Waterfall Trail on 16th, 1 heard on the Matumbo Trail on 17th, and 1 seen on the Waterfall Trail on 19th. 1 seen on the trail behind the lodge wetland on 15th. 1 seen on the Waterfall Trail but date not recorded. 2 along the road to the Matumbo Trail on 15th. 1 on the Elfin Forest Trail on 12th, 1 on the Long Trail at Vale das Taquaras on 14th, 1 on the road to the Matumbo Trail 17th, and 1 there (visiting a nest) on 21st. 1 along the dirt road from the reserve entrance to the main road on 21st. Seen frequently at the lodge wetland. 2 at the lodge wetland on 11th and 1 there on 15th. 1 on the Elfin Forest Trail on 16th, 1 on the Matumbo Trail on 17th and 2 there on 21st. 1 seen on the Waterfall Trail and 1 seen on the Elfin Forest Trail on 12th, 1 heard at Vale das Taquaras on 14th, 1 heard on the Matumbo Trail on 17th, 1 seen on the Waterfall Trail on 19th, and 1 seen on the Matumbo Trail but date not recorded. 2 on the Waterfall Trail on 19th. Common in more open habitats. Fairly common at REGUA and Vale das Taquaras. 1+ on the Waterfall Trail on 12th, and 2 at Vale das Taquaras on 13th. 1 on the Matumbo Trail on 15th, and 2 on the dirt road to the Matumbo Trail and 1 on the Matumbo Trail on 21st. 3 on the Waterfall Trail (including a pair building a nest at the waterfall) on 12th, 1 at Vale das Taquaras on 13th and 2 there on 14th, 1 on the Matumbo Trail on 15th, 2 along the track near the start of the Matumbo Trail on 17th, 1-2 on the Waterfall Trail on 19th, 1 on the Matumbo Trail and 1 on the track near the start of the Matumbo Trail on 21st. 2 on trails adjacent to the lodge wetland on 15th. 1 female on the Waterfall Trail on 12th, 1 male at Vale das Taquaras on 13th, and 1 pair building a nest at Vale das Taquaras on 14th. 1 near the top of the Elfin Forest Trail on 16th. Seen frequently at the lodge wetland and the dirt road to the Matumbo Trail. Seen at Rio de Janeiro international airport. Seen frequently at the lodge wetland, especially around the hide. 2 seen along the trail behind the lodge wetland on 15th. 1 seen in the lodge garden and 1 seen by Casa Anibal on 11th, 1 along the trail behind the lodge wetland on 15th, 1+ seen by post 550 on the Light Blue Trail on 19th, 1 seen on the Nursery Trail and 2 seen on the Light Blue Trail on 20th. Also often heard at REGUA. Seen regularly at the lodge wetland. 1 female at Vale das Taquaras on 13th, and 1 male at Pico da Caledonia on 18th. Seen and heard often at REGUA. 1 at Vale das Taquaras on 14th and 1 at Pico da Caledonia on 18th. 1 seen at the lodge wetland on 11th, and 1 heard on the trail behind following the forest edge behind the lodge wetland on 15th. 2 watched eating a chick beside the road at Pico da Caledonia on 18th, 1 seen on the Elfin Forest Trail on 16th, and others heard at REGUA and Vale das Taquaras on 14th. Heard frequently at REGUA. 1 seen along the road to the Matumbo Trail was our only sighting. 1 seen well at the lodge wetland (just between the small wooden bridge and the hide) on 11th and 15th. 1 at Vale das Taquaras on 13th and 1+ there on 14th. At REGUA 2 on the Matumbo Trail on 21st. 1 heard Pico da Caledonia on 18th was our only record. 1 seen at the lodge wetland on 11th was, very surprisingly, our only record. Fairly common around the lodge garden and the lodge wetland, where the highest count was 7+ on 15th. Also 1 male on the Waterfall Trail on 19th. 2 seen well at the top of the Elfin Forest Trail on 16th. 1 seen from the car on the dirt road to Vale das Taquaras on 13th, and 1 at Vale das Taquaras on 14th. 1 on the Elfin Forest Trail on 16th was our only record. 2+ on the trail following the forest edge behind the lodge wetland on 15th, and 1 in the lodge garden on 21st. 1+ in the lodge garden on 11th, 1 male along the dirt road to the Matumbo Trail on 15th, and 2 in the lodge garden on 21st. 1 on the Elfin Forest Trail on 12th, 2 there on 16th, and 1 on the Matumbo Trail on 17th. Seen occasionally at REGUA, and 1 heard at Vale das Taquaras on 14th. 1 at the waterfall on the Waterfall Trail on 12th, 1 male on the Elfin Forest Trail on 16th, 3+ on the Matumbo Trail on 17th, and 1+ male on the Waterfall Trail on 19th. Heard on the Waterfall Trail on 12th, several seen on the Waterfall Trail and 1 seen on the Elfin Forest Trail on 16th, and about 4 seen on the Matumbo Trail on 17th. Seen often around the lodge wetland. Also 5+ at the open area at the top of the 4x4 Track to Casa Anibal on 11th, and a pair at the open area on the first stretch of the Waterfall Trail on 19th. 1 heard on the Waterfall Trail on 12th and 1 seen on the Elfin Forest Trail on 16th. Seen frequently at REGUA and Vale das Taquaras. Up to 3 seen frequently at the lodge wetland. Several at Pico da Caledonia on 18th. Much scarcer than on our visit to REGUA last year when they were everywhere. 1 female on the 4x4 Track to Casa Anibal on 11th, and 1 male at the lodge wetland on 15th. 1 male on the trail following the forest edge behind the lodge wetland on 15th. 1 heard on the Waterfall Trail on 12th, 1 heard and 1 male seen on the Elfin Forest Trail on 16th, and 1 on the road to the Matumbo Trail on 17th. 3 seen at very close range at the top of the Elfin Forest Trail on 16th. 2 on the Matumbo Trail on 21st. Seen frequently at REGUA. Also seen at Vale das Taquaras on 13th and 14th, and at Pico da Caledonia on 18th. Up to 2 seen frequently in the lodge garden and around the lodge wetland, and also seen at Pico da Caledonia on 18th. 3 males and 2 females together on the Waterfall Trail on 19th. 1 on the lodge drive on 11th, 1 at the lodge wetland on 15th, and 1 along the dirt road to the Matumbo Trail on 21st. Many seen well and photographed at Pico da Caledonia on 18th. 2 males seen at the lodge wetland on 20th (note these birds are common at REGUA, but I often didn't bother looking at the grassquits and seedeaters). 1 female at the lodge wetland on 11th, and 1 male at the lodge wetland on 15th. 2 on the Long Trail at Vale das Taquaras on 13th and 1 there on 14th. 2 seen well along the Long Trail at Vale das Taquaras on 14th. 1 heard but frustratingly did not show, at the top of the Elfin Forest Trail on 16th. 1 in the newly planted area in the north-east corner of the lodge wetland on 15th. 1+ at Vale das Taquaras on 13th. 1+ on the 4x4 Track to Casa Anibal on 11th, 1 on the trail following the forest edge behind the lodge wetland on 15th, and 1 on the road to the Matumbo Trail on 17th. 1 heard on the Elfin Forest Trail on 16th. 1+ heard at Vale das Taquaras on 13th, 1 heard and another seen at the top of the Elfin Forest Trail on 16th, and 2 seen at Pico da Caledonia on 18th. A small flock on the Waterfall Trail on 12th. Seen frequently at the lodge wetland where large numbers were roosting in the reeds in front of the hide in the evenings. A few on along the dirt road to the Matumbo Trail on 21st. 2 seen on along the dirt road to the Matumbo Trail on 17th and 1 there on 21st. 1 at the lodge wetland on 15th. Seen frequently around the REGUA office and in towns and villages. All records are at REGUA unless specified otherwise. 1 immature found dehydrated in the middle of the dirt road to the Matumbo Trail on 17th, was rescued and released by the nursery at REGUA. Another was seen on the Waterfall Trail on 19th. Several seen on the Elfin Forest Trail on 16th. 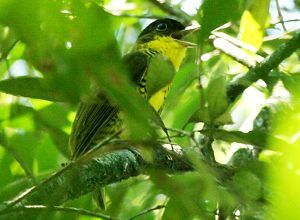 REGUA is a fantastic place to base yourself to see many of the endemics of the Atlantic Forest. The reserve has lots of trails to keep you busy, most other birding sites are within easy travelling distance, and day trips can be easily arranged at the lodge. In 11 days birding we managed to record a total of 271 species, (of which 257 were seen). In the time we had available we could have also visited Praia Seca for Restinga Antwren and Sumidouro for Three-toed Jacamar and Rio de Janeiro Antbird, but we chose not to because we had seen most of the additional species that these day trips would have given us on our trip last year. An added bonus of REGUA is that your money directly funds the conservation of the Atlantic Forest, and with only 7% of the original forest area remaining, this habitat needs all the help it can get. We can't recommend REGUA enough and hopefully it won't be too long before we are able return. If you have any questions then please contact me at lee.dingain@hotmail.co.uk.